Schoola, based in San Francisco, is an online school fundraiser that sells donated clothes. The money supports art, music, and sports. Schoola also partners with the Malala Fund, VH1's Save the Music Foundation, and Girls on the Run. I designed collateral for school outreach and online promotion. 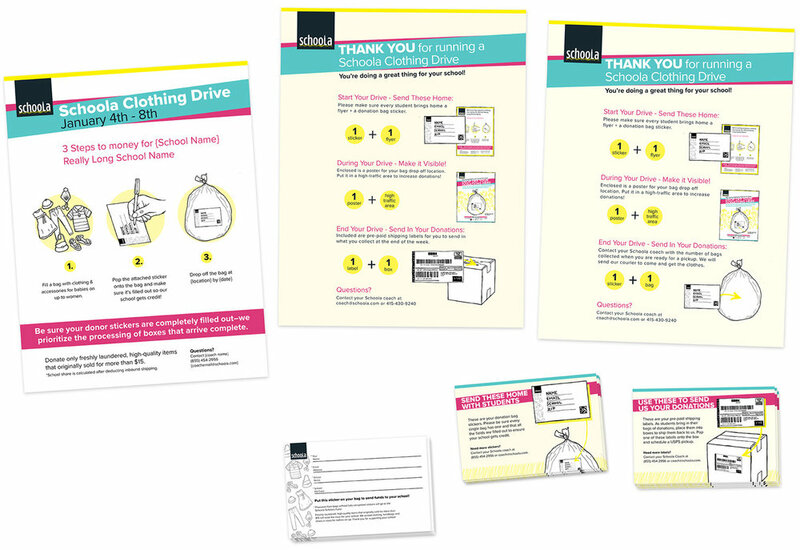 At Schoola, I redesigned the materials that schools use to promote clothing donation fundraisers. One issue with the old design was that the instructions for how to collect and ship the clothes were unclear. People at the schools often didn’t understand what they needed to do. In designing the new poster I worked hard to make sure that they would. The old design featured black and white photos, which did’t reproduce well when they were printed by the schools—they were always too grainy and blotchy. Instead of using photos, I drew black and white illustrations. They were more attractive than the photos, and they also reproduced well on school printers. I designed flyers for Schoola’s sales team to find schools interested in running drives. Again, I created black and white drawings and added Schoola-brand colors to keep the look consistent and clear. After a school books a drive, a kit is sent to the school with all the materials it needs. I designed pamphlets to explain how to distribute the materials and collect the clothes. In addition to designing materials for school outreach, I also worked with the marketing team to create web ads and emails. I used the brand guidelines to make eye catching designs to promote sales. This bin collects clothes year-round. It was made of corrugated plastic, and could be broken down and put back together.